I finally got a Christmas tree this week, even though it was almost 70 degrees here a few days ago. Last year I skirted my tree with a bunch of burlap I had leftover, but apparently between then and now it has vanished into other projects. Disappointed with the selection of pre-made skirts out there (not to mention the price, OUCH! ), I decided to come up with my own version. Isn’t it awesome? Industrial chic? Ok fine, I’m just joshin ya. 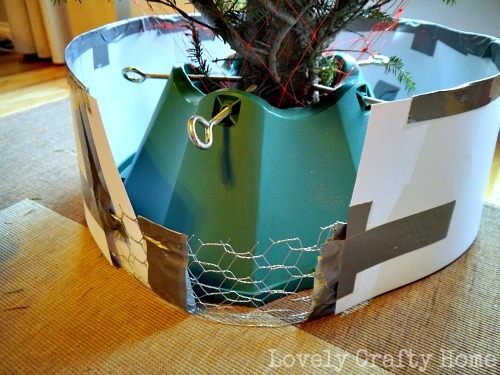 So I’ve been seeing a lot of tree-in-basket-or-pot pictures this year in magazines, and I love the streamlined look. 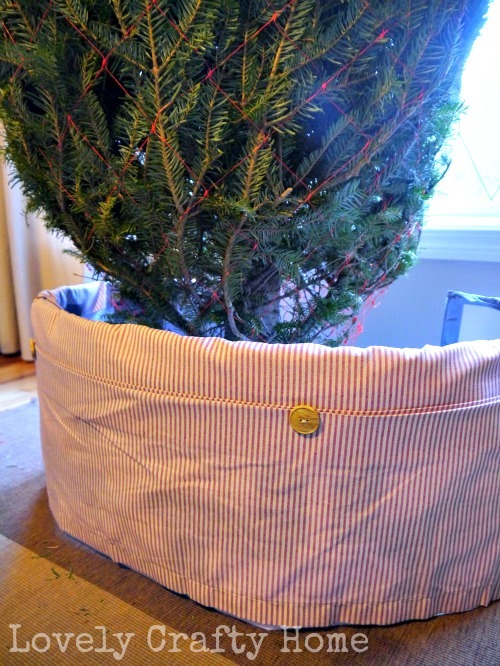 Instead of putting my tree in a basket, I wanted to create a wrap version that went on and off like a traditional skirt (for ease of watering, vacuuming, etc). 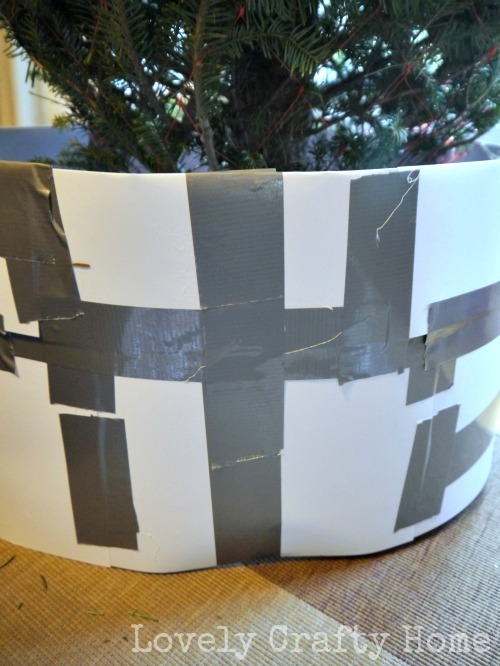 Clearly there are better ways to do this than the duck tape monstrosity shown above, but I kinda wanted this to be a $0 project. I challenged myself to do it with materials I had on hand. I scavenged the house for materials and found the chicken wire which I sandwiched between card stock using duck tape- a lot of it. 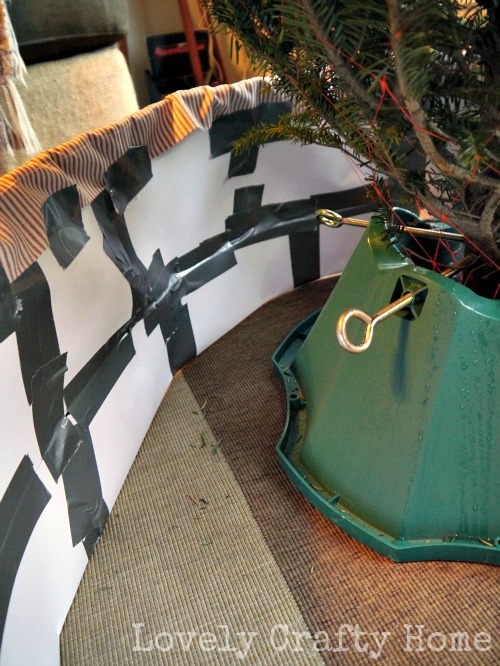 After I’d made a circle big enough to go around the whole base, I took some tin snips and cut a slit to open it up. Add a piece of fabric (in this case a thrifted window valance I got a few months ago). Yep, more duck tape. Nevermind about the inside, on the outside it looks awesome! 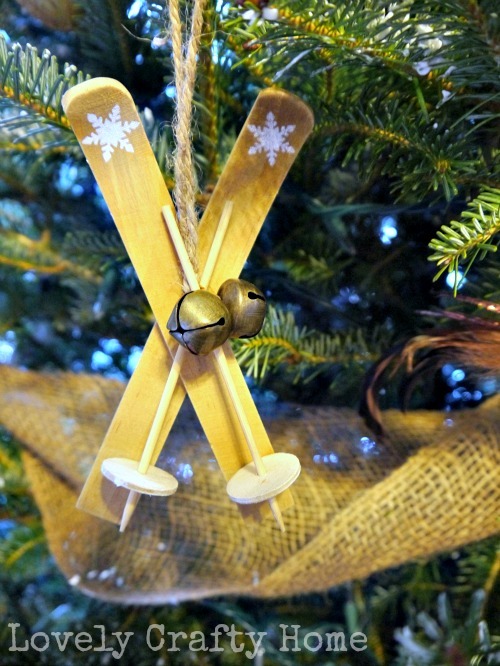 More tree pictures to follow, stay tuned! That looks great! 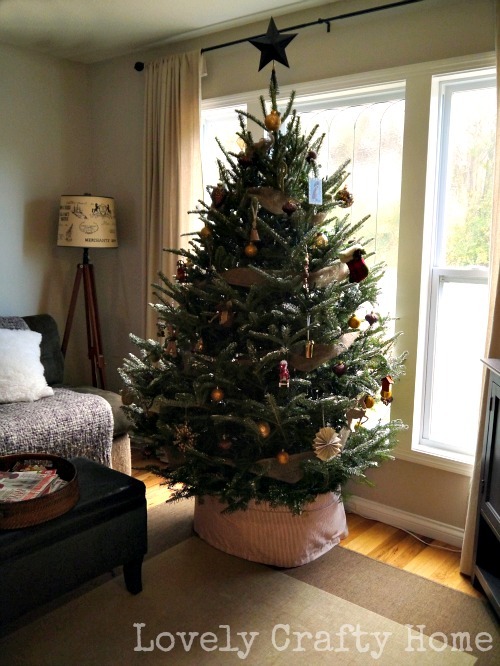 We have a tree skirt that we bought years ago, and I like it fine….but it doesn’t fit very well around our giant tree stand….I bet something like this would work a lot better. You floor me every time! Looks fabulous!